In August 2018 we held Summer Electro Camp. It´s camp for kids from 10 to 16 years. This year there were 45 members with interest in electrical engineering. They did kit soldering, some theory of electric and also some outdoor games. So the week holds the summer vibes and fun spirit. 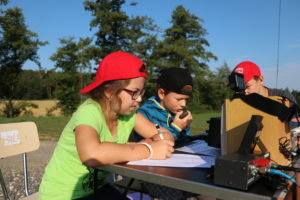 The youngsters could learn about amateur radio. During the camp, they activated a club station OK2KET – locator JN78XW. They pulled the HF dipoles at 80, 40 and 20 m. Transceived on Icom 756 pro III. 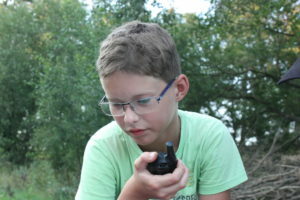 Kids participated in QRP race and SSB league (Czech-Slovak radio amateur contest in the 3,7 MHz band). Few weeks later, I met one participat, you can imagine how happy I was when he talked with me, about how he can get licenced. Our Czech Yota Team had a presentation about Yota South Africa in Holice at the end of August. Holice are the biggest meeting of HAM/CB/electro enthusiast in the Czech Republic. As a promo of this event, we were directly approaching youngsters which we met at the meeting to join our presentation. Therefore there were some brand new youngsters, which we have never heard before. Overall there were 16 people at the presentation. We showed them photos from South Africa and told the overall story. In the end, we invited them for Yota 2019. Which naturally sparked interest in the youngsters and concerns in their parents, mainly about the cost of the event. We had the opportunity to discuss the financial issue directly and explain to them that most probably it will be held in Europe so the travelling costs are minimal and the entrance fee for the event is just a few Euros. To keep a fresh connection with youngsters we approached during Holice, we had created FB group Hamsters CZ (HAM + Youngsters = Hamsters 😀 ). They can share their success in contests, they can ask about everything or find some new friends in HAM world. During Yota December, we will organize weekend gathering where we will take part in the Yota activity. It will be two days and nights from 14.12. to 16.12.2018. 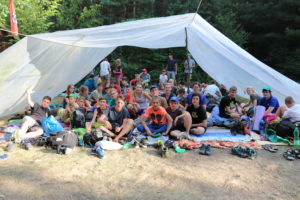 We will hold it in Scouts clubhouse in Rychnov nad Kneznou which is approximately in the middle of the Czech Republic, so youngsters from different parts can easily come. As we want to build the community not only bring the youngsters to the radio, we will make various activities where youngsters can get to know each other. The plan is to make a campfire, trip to nature, play some board games… so we hope it’s not gonna be only radio weekend, but more like a weekend with friends, where we simply enjoy our free time. This event is also communicated on the HAMSTERS CZ so all the group members can meet each other in person. There are also two radio enthusiasts without the licence, who want to take a participation, so we hope to incorporate them into our group as fast as possible. Martina OK2YLQ, Jan OK1JD, Jindra OK1NOR. I like the name and idea of an “Electro Camp” ! It’s great to read about all the youngster activities in the Czech Republic. Pretty cool that you’ve been able to start a youngster FB group!